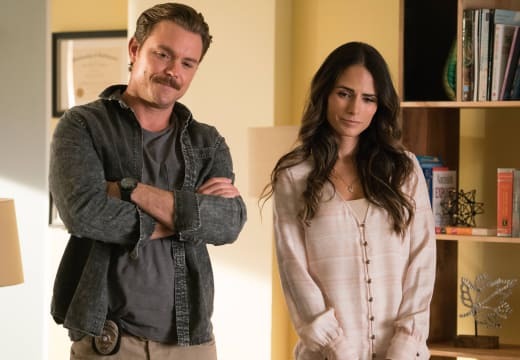 Lethal Weapon Season 1 Episode 8 Review: Can I Get a Witness? There's a little bit of a role reversal happening on our favorite Wednesday night show. Murtaugh may not want to go climbing at Mount Kilimanjaro, but he definitely took a ride on the wild side on Lethal Weapon Season 1 Episode 8 when he decided to buy a motorcycle and relive his youth. Not only that, he also channeled his inner Batman when he took down the guy at Christy's apartment (that breaking apart of the gun seemed totally The Dark Knight to me) and then slammed the same guy's head down in the interrogation room. These are things we don't expect Murtaugh to be doing. How often does Captain Avery come into an interrogation room (like Jim Gordon tried to in said movie) to calm down a raging Murtaugh? It's usually Riggs who's walking on the wild side, not Murtaugh. But, I guess when someone almost blows your brains out, you can't help but go off the rails a bit. To be honest, I really like that Murtaugh is a bit more edgy than before. I'll forget more about CHiPs while I'm sleeping than you'll ever know in your entire life. Permalink: I'll forget more about CHIPS while I'm sleeping than you'll ever know in your entire life. He hasn't lost his humor, which is a good thing. The CHiPs gag was great, especially when he was talking to Bailey about it and she acted like it was a centuries-old show. Even better was when Cruz blurted out he never even heard of the show. Oh, these young people today. Tsk. Tsk. But, have you noticed that as Murtaugh takes on more of Riggs' personality, Riggs' takes on more of Murtaugh's, including his humor? Riggs' banter with Ethan, especially the final scene at the hospital, was hilarious. And I really loved how Riggs grew (or opened up) from his interactions with Ethan. Riggs, can you drive me over. We can run all the red lights again. Permalink: Riggs, can you drive me over. We can run all the red lights again. If Ethan ever visits Riggs again, Riggs' dog is going to give him the biggest faceful of licks ever for getting the guy to buy him some real dog food. And, how about those bananas? When does Riggs EVER eat healthy? I also like that he bought that bag of Cheesy Puffs and put it on top of his fridge. He may never see Ethan again, but Ethan is going to remember him forever. Yes, $147,000 is a lot of cash. I've talked before about the chemistry between everyone on this show, but it comes through even with its guest stars. I really felt like Teo Briones, who played Ethan, had always been part of the show. He fit in so well. It's too bad Riggs is Riggs and couldn't get together with Ethan's mom. He would've made/will make a fabulous dad. We saw it with Roger, Jr., and it showed through again this hour. As closed off as he tries to be, Riggs has lots of heart. He can't hide who he is. Easy there, cowboy. Don't shoot. It's okay, pal. I'm a good guy. Permalink: Easy there, cowboy. Don't shoot. It's okay, pal. I'm a good guy. I just wish he would visit Miranda's parents. Don't you guys think it's about time we delved a bit more into that relationship? I know it's painful for Riggs, but it's also not very nice of him to be blowing them off the way he's been doing. They deserve a little more respect from him than what he's doling out right now. It goes without saying that my love for Lethal Weapon has yet to waver. What did you think of "Can I Get a Witness"? Hit the comments and share your thoughts! 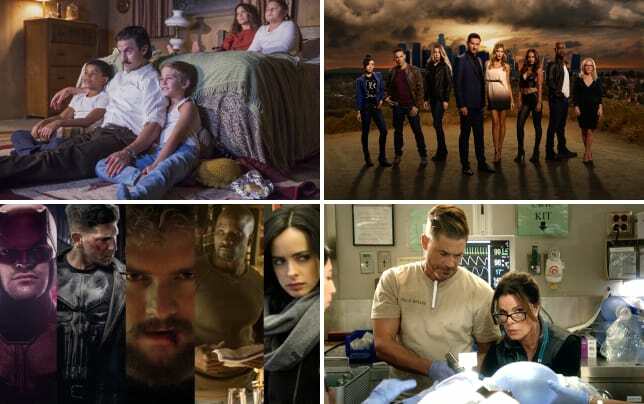 If you can't get enough of Riggs, Murtaugh, and the gang, you can watch Lethal Weapon online right here via TV Fanatic! Girdle? People still wear those things? Permalink: Girdle? People still wear those things? Dangerous? C'mon, honey, what are you worried about danger? You ride around all day with Marin Riggs. 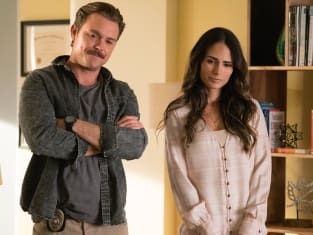 Lethal Weapon Review: Can I Get a Witness?